Port Aransas has two long jetties that hold large swells and give protection from adverse winds. The North jetty forms the breaks at St. Joes Island. The South jetty and Horace Caldwell pier enhances the breaks in Port Aransas itself. 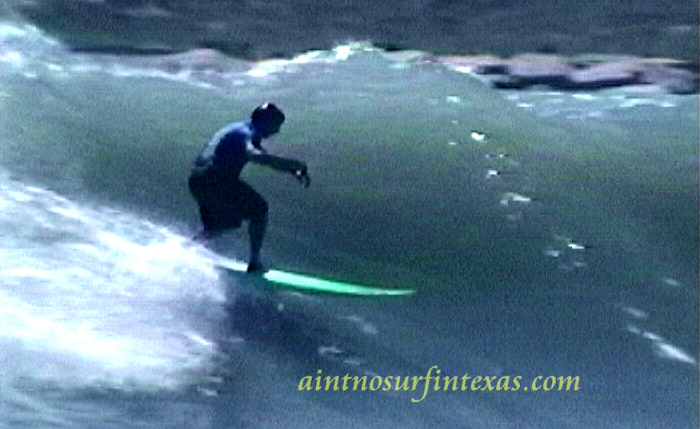 Generally known as a longboard wave, Port A. really shows itself in Hurricane and Tropical Storm swells. Below is a photo still from the movie shot during Tropical Storm Isidore in 2002. The Surfside Channel is another place that holds large swells. The Channel wave breaks between the two jetties at Freeport/Brazosport. It is usually considered an alternative option to Surfside or Quintana when they are too big and sloppy. This is a still image from the video shot during Tropical Storm Josephine in 1996. Being an island in the Gulf of Mexico, Galveston has a fun sea-side lifestyle with many public beaches. Along the seawall, the surfer finds numerous short jetties or groins that augment the surf, especially in winter when cold fronts produce clean conditions. Before their demise in Hurricane Ike in 2008, the Balinese Room and 61st street pier could produce a well-formed wave. Everyone loves the hollow waves of 37th street and Kris Hopkins is one of the best at riding them. Here he is during a crisp, November swell. The channel and cove at South Padre Island can produce a wave legendary to Texas surfers. Located between the Boca Chica and Isla Blanca jetties it usually only shows during biggest swells. Under the right conditions large, fast, down-the-line waves form and break left with excellent shape. Below, in another photo still from the surf movie is Kevin Tansey catching the channel breaking during Hurricane Georges in October 1998.